Enjoy playing the game with your friends in a variety of game modes. Mask Gun is a thrilling, fast-paced and action-packed shooter. There are tons of guns and armors to unlock and add to your arsenal, in addition to being able to customize your character with a myriad of masks... hence the game title. Do you have what it takes to battle to the top of the ranks with your team? To get straight to the topic, Mask Gun is a casual real-time Multiplayer Shooter built for touch controls. The game takes you on a short tutorial to introduce you to the game’s controls. You can notice that the screen is not that cluttered to make sure that you do not miss out on any of the action. You have a small hidden joystick on the left side of the screen and you can drag the right side of the screen to look around and aim. And if you encounter enemies, you can hold the right side to shoot and aim while you move around. 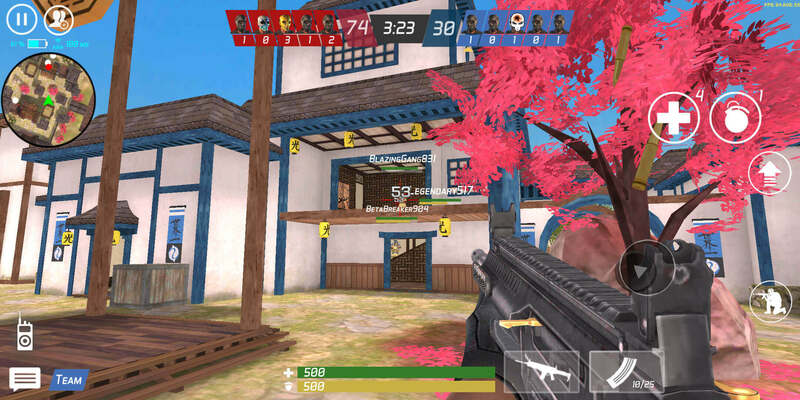 You can reload by tapping on the magazine icon on the lower side of the screen. 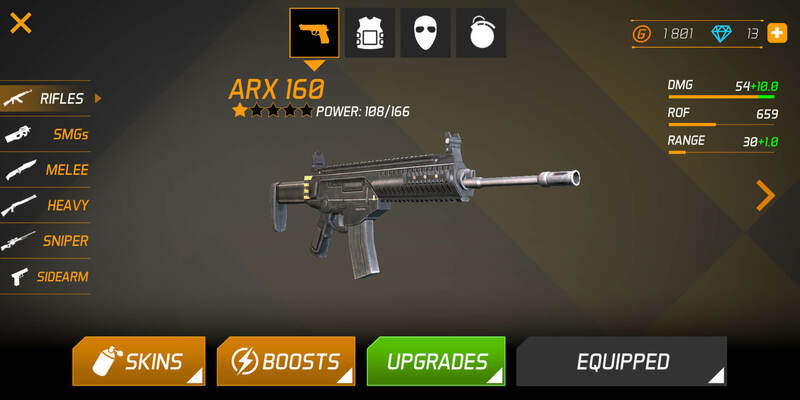 And you can switch weapons by tapping on the gun icon which shows the guns in your current loadout. You can see your health bar and armor gauge at the bottom part of the screen. You can get better armor by purchasing them in the shop. Armor makes you harder to kill but you can go for a risky maneuver and switch to your knife to instantly kill them in close range. You can also jump around and crouch by pressing the respective icons on the right side. And you can heal yourself by tapping on the health icon and throw grenades by tapping on the grenade icon which would both be found on the top right side of the screen. You can even communicate with your teammates and use radio commands by tapping on the icons on the lower side of the screen. Communication is useful for team games to make sure that you can develop a bit of strategy. But there are times that you might accidentally tap on it so I can suggest putting your left hand a bit higher on the left side just to avoid any issues. There are currently 3 game modes; namely, Deathmatch, Team Deathmatch, and bomb defusal mode. You can instantly jump into a random game by pressing on the play button in the main menu but you can tap on lobby to look for specific game modes or join a certain room. There can be at most 10 players in a match so you can expect to go for 5 v 5 matches for team games. And there are four different arena which add variety to positioning and shooting style. You can buy tons of different guns such as SMGs, Assault Rifles, Pistols, Heavy weaponry, Shotguns, and even Sniper Rifles. You can use the scope button once you have Snipers equipped. 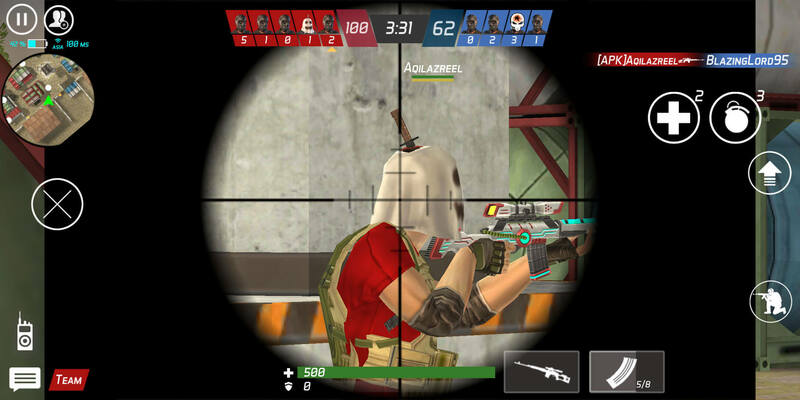 It takes a bit of skill to use them but you can easily get headshots once you have mastered them. Overall, the game runs smoothly which ensures a fun and exciting shooting experience. And getting into a match is fast since there is virtually no wait time. And you can respawn quite fast so you can feel the intense non-stop action. You can download the game for free from Google Play and the App Store.